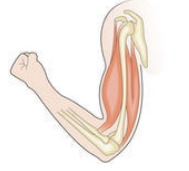 Learning about the human body can be fun when you’re using Science4Us! Nestled in the Animal module, Science4Us has provided multiple standard-aligned, human body lessons in the second grade offline components. 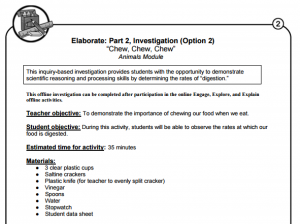 One of our favorite activities includes the offline investigation called, “Chew, Chew, Chew.” In this lesson students will learn the importance of breaking down food into smaller pieces when they eat. The students will collect data to determine how fast “food” digests in vinegar. This allows them to use multiple tools including measuring cups, stop watches, data tables and graphs! In the Connection to the Arts activity found in Session 5, students will play, “Pin the Heart on the Body.” This activity provides students with the opportunity to review organs and their locations on the human body. The rules are similar to the similarly-named, age-old party game! Science4Us is an award-winning K-2, standards-based, science curriculum. Digitally-delivered Science4Us provides over 350 online interactive activities and over 1,000 offline activities. Using the 5E model, teachers can provide their kindergarten, 1st grade and 2nd grade students with a solid foundational science lesson.